Debut album Skylines from NY based Australian saxophonist Evan Harris documents a deeply personal journey by a young saxophonist at the top of his game breaking into the toughest music scene in the world, New York City. The haunting yet uplifting melodies and incredible improvisations from this cast of truly international heavyweights give the listener an insight into the exciting future of Australian Jazz by a dynamic musician making waves abroad. Beautifully recorded at ‘Systems Two Studios’ in Brooklyn by multi-Grammy winning engineer Mike Marciano at 96k hTz, Evan's Freshman release gives us a glimpse at the promising future of Australian jazz. Skylines is available digitally, and will be released on CD and vinyl during early 2018 through 54 Records. Featuring a foreword by co-producer Frank Kimbrough (Maria Schneider Orchestra and Jazz Composers Collective), and photographs of the recording sessions by Lauren Desberg. CDs will be issued in a 6-panel gatefold wallet. Vinyls will be issued on 155g virgin stock printed by Brooklyn Phono in a Euro-style gloss vinyl jacket. Domestic and international shipping available from both Australia and USA. Preorder includes immediate download of digital files. Skylines has been shortlisted for three 2018 Australian Jazz Bell Awards: for Best Australian Instrumental Jazz Album, Best Produced Album and Young Australian Jazz Artist of the Year. Is about a shack on the Hawkesbury River (on the central coast of NSW) that my family frequented throughout my childhood. There was a jetty that extended from the back yard, through the mangroves, and to the river. The mangroves created a narrow corridor through which the river was visible. The view was enchanting. Is inspired by Newton's third law, which states that every force has an equal and opposite reaction. Applied as a philosophy, success is the result of failure. Growth and beauty is a result of hardship and loss. A manifestation of the same adaption of Newton's third law. Musical depictions of the jagged panorama as seen from my window in Midtown Manhattan, and NYC's varying moods throughout the day. The morning sun is tranquil, the afternoon sun is eery, and the daylight is vibrant and animate. Is about my reconciling with the futility of the many situations we find ourselves in as a society. I began composing this piece having witnessed Times Square just minutes after Trump was elected as president. The look of hopelessness in the peoples' eyes was almost disturbing as the stillness and silence in a place that would typically be bustling. It was like a scene from a dystopian movie. Is about feeling revitalised after a period of deep introspection that was prompted by a series of somber events. Inspired by the process of finding balance and overcoming the sense of isolation having moved to the other side of the planet. For Judy Bailey. Is about the sense of relief knowing winter has passed, and feeling the warmth of the sun. 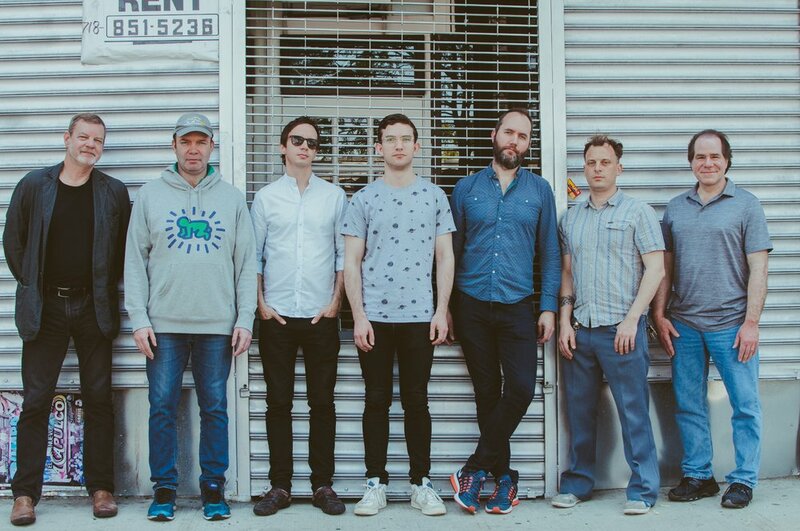 Left to right: Frank Kimbrough, Sean Wayland, Des White, Evan Harris, Will Vinson, Jochen Rueckert, Mike Marciano opposite Systems Two Studios, Ditmas Ave.
Iron in the Blood is a captivating new album exploring the rich tapestry of Australia’s colonial past. Featuring music by award-winning saxophonist/composer Jeremy Rose, the album is inspired by and features text from Robert Hughes’ seminal work The Fatal Shore, read by Philip Quast (three-time Laurence Olivier Award winner) and William Zappa (Mad Max 2; Dead Europe). Celebrated trumpeter Scott Tinkler and composer Andy Fiddes have teamed up with Australia’s leading jazz orchestra to create a superb new album for Rattle Jazz. Further affirming it’s artistic mission, the Sydney-based Jazzgroove Mothership Orchestra has produced a recording that highlights the exceptional depth and breadth of talent at the cutting edge of the Australian jazz scene, a work of great quality and nuance. The earthy, wooden, metallic world of acoustic jazz, through future-tech fusion, finally climaxing in the unleashing of sonic weapons. Featuring James Muller, Carl Morgan, Matilda Abraham, Steve Barry, Alex Boneham, Desmond White, Evan Harris and Ben Vanderwal. Mixed by Andre Houghton and Mike Rivett. Mastered at the Exchange, London by Simon Davey. Artwork by Ej Zyla. Independently produced and funded, The Opening Statement is a showcase of the music of bandleader Jenna Cave. The collection of selected works, composed between 2006 to 2013, were rewritten for Divergence Jazz Orchestra in collaboration with Paul Weber, and collectively developed for performance by the ensemble. At the time of recording the group was made up of 18 of Sydney’s most committed young jazz musicians, aged 19 to 34, who shared a special interest in performing original large ensemble music.